Anney Thomas, co-owner of Chaat and Chai with Margie Felton, sat down with Liz from West Passyunk Neighbors Association (westpassyunk.org) to talk about their restaurant. I’m originally from South India, but I’ve lived in Philly for 30-something years. How long has Chaat and Chai been open? Nine months! Since November 10th, 2015. I was looking around originally in East Passyunk, but nothing really jumped out at me or suited what I was looking for. One day, I saw this front door and was like, “Oh my god, that’s beautiful. I need to be there.” It was renovated by my landlord Marco, who is amazing. I love him. How much has the neighborhood changed since you opened? When we first moved in here, a lot of people told us not to do it. But I knew this neighborhood and what was going on here. I did a lot of research and saw the development going on in this area. And as soon we opened, CityCare Pharmacy opened, and two breweries announced that they are opening nearby, and I also have a friend opening a grocery store at 17th and McKean. We’re definitely a destination neighborhood. What’s your favorite thing about our neighborhood? I really like the diversity in this neighborhood. There are so many family-owned ethnic restaurants in this neighborhood that I love. There are a lot of restaurants in East Passyunk, but I think here we have a lot more diversity. This restaurant is perfect for West Passyunk. People have come in and said that our food is fusion, but nothing I’m doing is fusion. Everything is authentic, but our presentation is not-so-traditional, and that’s probably what’s different from a lot of traditional Indian restaurants. For example, the Shrimp Idli on our menu is traditionally served with coconut chutney and Sambar, but we serve it with shrimp curry. They’re both traditional South Indian foods, but every South Indian person who comes in here will come up to me and say, “You know, this is really served with Sambar”, and I’m like, “I know!” South Indian dishes inspire many of our dishes, particularly food from Kerala, where my family is from. A lot of it is my family’s recipes and their food, but of course I don’t want to serve strictly South Indian food. The Kerala Beef Short Rib is very popular. The butternut squash curry is a traditional Kerala dish, and in India we actually make it with pumpkin, but that one is also popular. All the chaats and curries are popular, too. ​The pachadi is delicious. This is a South Indian side dish that’s similar to the North Indian side dish raita, which is made with yogurt and cucumbers. This is made a little bit differently, though. It’s warmed and cooked a little bit, and we make it with beets. There’s also coconut, mustard seeds, curry leaves, chili peppers, yogurt. It’s surprisingly delicious and there are all kinds of layers of delicious flavors. The black chickpea curry, which is vegan, is also great. A lot of people are not familiar with black chickpeas. They’re a lit bit different; they have a nice texture and even I don’t like regular chickpeas, but I love this. The butternut squash curry is like home to me. I also really love lamb, so the Lamb Vindaloo Curry is a favorite. Margie’s favorite dishes are the Kerala Beef Short Ribs and Dhaba Chicken Curry. Can you tell us about any special events you have coming up? We have a few press events coming up. We have a FYI Philly segment airing this Saturday, August 20th at 7pm on Channel 6. 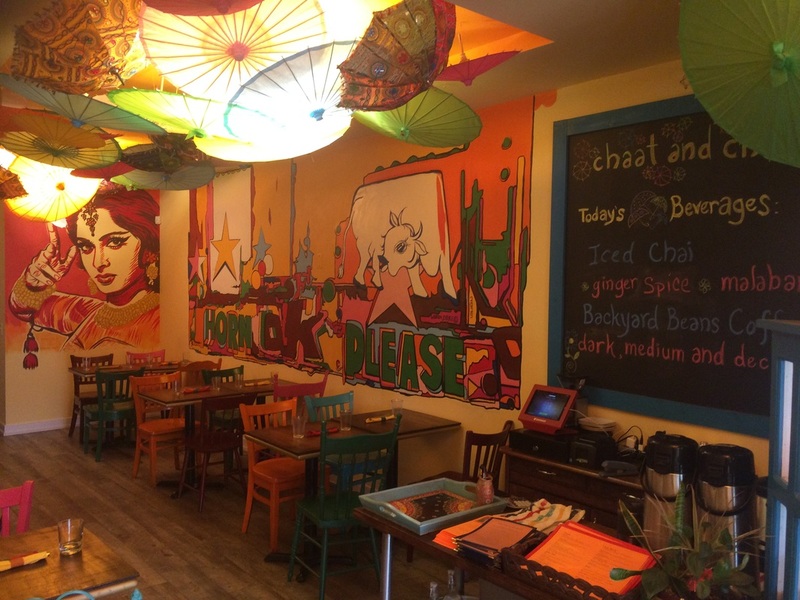 This particular segment is about the Best of Philly ethnic restaurants. What are your hopes for Snyder Avenue in the near and distant future? I would love to see more restaurants opening nearby. ​What kind of food do you hope to serve for the Sausage Fest? We’re making up an Indian-spiced chicken sausage and a lamb sausage. We’ll be serving them with wraps, like naan and paratha. For vegetarians, we’ll have veggie samosas. We’re also going to serve lemonades, iced chai, Indian sodas, and lassi. Anything else you want to say to the folks in South Philly? I just want to say thank you to the neighborhood and the neighborhood organizations for supporting us. Chaat and Chai is of the restaurants participating in the South Philly SausageFest (southphillysausagefest.com) on Saturday, September 10th, from 12-8pm.